Smokie has just discovered a few new places, and one of them is the top of the wardrobe where so many cats have sat to watch the day and nap. It has a great view down the steps and into both upstairs rooms, and right next to the bathroom door a kitty can just look around the door frame to see what’s happening in there. It’s a favorite place, but not all that easy to get to unless a ninja shows you how to stand here, jump up onto the windowsill, carefully turn around and leap straight up onto the top of the wardrobe., where Smokie encountered…himself, or at least, another cat. I’ve been quite busy in my studio, finishing up my annual calendars and a few other design projects as well as some handmade goods you’ll soon see. With that and some commercial design work, I’ve been very pressed for time but will soon have my posts back on schedule. 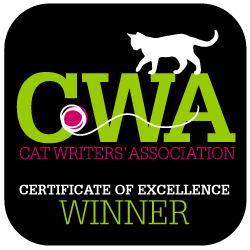 Read more feline-themed poetry here on The Creative Cat, including a few I’ve recorded and even created video slideshows to illustrate. Click here or choose Poetry from the categories list. My poetry is organized on my website on one page, all alphabetical, so you’d have to scroll down the list, and many of these poems also appear in the pages I’ve built for my annual poetry readings. I encourage you to visit those pages so you can see even more artwork, even if it isn’t of my cats or my backyard.